ECN stands for “Electronic Communication Network”. ECN is the system of forex trading where traders are given direct access to the interbank market to trade forex as offered by the major banks which function as liquidity providers. This system is also called Direct Market Access (DMA) trading. This system of trading is totally different from the style of trading that most retail forex traders are used to, which is trading with market makers. Market makers organize everything from the pricing to the trade execution in-house; their traders have no access to the interbank market. ECN brokers are simply a channel to the interbank market; they do not provide trade executions in-house. All executions are done with the major banks (liquidity providers) in the interbank market. ECN trading is encouraged for traders with access to a greater pool of funds. You do not necessarily have to work in banks like Goldman Sachs or Nomura to be classified as an institutional trader. You may own a very successful personal business with good revenue flows, and may just decide to diversify your income base by committing these funds to a fund manager or by setting up your own trade facility. Some people may come together in groups of four or five persons to setup trade facilities in a small office, with a few computers and broadband internet. These setups are becoming more common and rather than remain with retail brokers, such traders could get into ECN brokerage setups. What Does ECN Trading Entail ? ECN trading is the totality of the trading process which emanates from the trader’s computer, through the broker’s direct access network, to the interbank market, and all the way back to the trader’s computer where the data manifests as a trade execution or even a simple piece of data. The entire aim of ECN trading is to give the trader an edge over others. Recall that ECN brokers do not trade as a counterparty; their earnings are strictly from the trader’s commissions and spreads. So it is in the interest of the ECN broker to arm the trader with tools that will motivate constant trading. a) Obtaining appropriate trading technology capable of delivering ultra-low latency. b) Dissipation of large orders across several network venues to achieve faster and better fill ratios. c) Minimal price variations as orders are passed between execution venues. d) Trade delivery at minimal hold time. e) Reduced market impact on trading activity. When orders are sent to the interbank market for execution, there may or may not be a hold time. 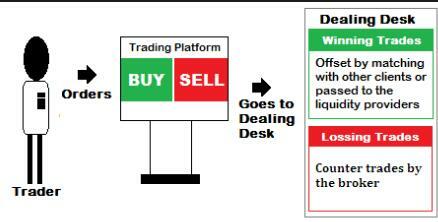 A hold time is simply the discretionary delay between the time the liquidity provider (LP) receives a trade order and when the LP executes the trade order. Millions of orders come in from all over the world and need to be sorted and matched for execution, all in a matter of milliseconds. It is essential that you use ECN networks that connect to LPs that can guarantee if possible, zero hold time. Your trade orders should either be matched instantly at the speed of light, or not matched at all. Hold times are usually extended on liquidity provider platforms with the “last look” facility, which allows some major players to see order flows and re-evaluate their positions before execution. Why is the hold time factor important? Hold times attract a cost, which has been measured by an industry technology provider in the UK to be about $25/million at 100ms. 60% of this cost is incurred in the first 10ms. So get a LP that ensures that you get zero hold time. Information is always key, and the speed at which orders arrive at venues will determine the strategy of trade execution. Market impact always affects the pricing provided to you by the LP in future. ECN orders are not always filled at one venue. It is therefore possible that if you have partial fills in one venue, other market players may receive information about your order flow and may decide to hedge it in another venue. This is how the last look phenomenon and hold times interact to cause your orders to have a price decay. Orders that have significant price decay will be subject to widened spreads and this has cost implications. What is an effective spread ? Many traders are only taught to consider the bid and ask prices which provide the lowest spreads. This should not be the only metric in trying to save cost. You may get a low spread on a currency pair, but if there is a hold time, or your orders are subjected to last look, your costs may be higher at the end of the day. So the effective spread should be that spread you pay which when factored with other metrics, still produces the cheapest outcomes for you.